Noelle Rose S.C. Rose & Co.
Our Artists >> S.C. Rose & Co. Seed Merchants & Growers. 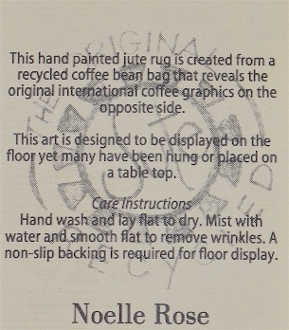 Hand painted 28″ x 40″ jute rug is created from a recycled coffee bean bag. This art is designed to be displayed on the floor but may alos be mounted on the wall or placed on a table top.